In his book, Journal of a Trapper, mountain man Osborne Russell describes climbing a steep ridge, then sitting to rest on a rock to look over a smooth, grassy vale where "thousands of mountain sheep were scattered up and down feeding on the short grass" while "crowds of little lambs were nimbly skipping and playing upon the banks of snow." It was July 11, 1834, and Russell, tired and cold after the climb, was nonetheless enthralled at the beauty of the scene before him. I like to think I may have found the very rock he sat on, a rough-edged slab of granite that commands a perfect view of that high alpine meadow, and of the sheep that still graze there. They're Rocky Mountain bighorns, and to sit in their presence in the high, wild and lonely country of northwest Wyoming they call home is nothing less than a royal privilege. It's a privilege, however, that may not last a lot longer, because this particular herd, once the largest in the Rockies, has been dwindling for several years and researchers aren't sure why. Of the four North American species of wild mountain sheep, the Rocky Mountain bighorns are the most numerous, today inhabiting the rugged landscapes of the Rockies from Alberta and British Columbia southward as far as Colorado. A million years ago their descendants crossed the frozen 50-mile wide Bering Strait joining Alaska and Russia, and that may actually be one of the reasons they're declining today. Their wild, prehistoric ancestors on the Russian steppes were never exposed to the diseases introduced by other animals, notably domestic sheep and goats, both of which are now raised by many ranchers living along the edges of mountain sheep habitat. Outfitters often use goats as pack animals when heading into the back country since they require only minimal care. "We're not convinced that's the only reason for the decline in this particular herd," notes veteran Wyoming Department of Game and Fish biologist Greg Anderson of the Lander (WY) regional office. "We've had die-offs before, most notably in 1990 when nearly half the herd, then numbering 2,000 head, died. 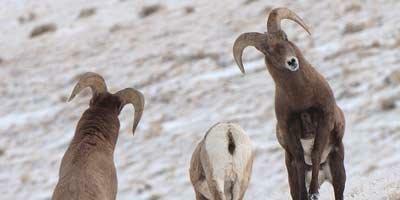 "In 2010 a slow decline began again, so that today the herd numbers slightly more than 500 head. What we're seeing now, however, is a recruitment of just 20 lambs per 100 ewes, which is not very good and doesn't bode well for the future." What's worse, notes Anderson, is that summer surveys, performed in those high meadows like the one Russell watched, show a recruitment of 65 lambs per 100 ewes, which is excellent. It means the lambs are dying after they come down into their lower winter range. In January 2012, Anderson and a large team of fellow game biologists and volunteers live-trapped and tested nearly four dozen animals, collecting blood and tissue samples, then sending them to Washington State University for testing. While preliminary lab results have shown several possible pathogens, including both pneumonia and lung worm, the main culprit might be a really bad bacteria named Manheimia heamolytica, which kills a sheep's white blood cells. "The problem," Anderson points out, "is that one of the animals in the herd can carry a disease like this and infect the others but not be infected herself. A number of the animals we trapped tested positive with this bacteria, but we have no idea which one might be the carrier." Thus, the answer why sheep numbers are declining isn't just around the corner. Anderson plans additional trapping and testing, for as he says, "We know a lot now, but not as much as we don't know." Watching them from his rocky seat as he did that day and many times thereafter throughout the next nine years he hunted and trapped in the very same Wind River region Anderson now manages, Russell, of course, never dreamed the huge herd of bighorns he admired so strongly could or would ever be threatened by domestic-borne diseases. In the spring and summer he watched ewes and lambs feeding, playing, and resting contentedly. In the autumn he could both hear and see the big rams smashing into each other as they fought for dominance to breed those ewes and produce still another generation of lambs. No doubt Russell also noticed how the rams communicated completely by body language rather than vocally after their violent clashes, in which the winner might also kick his opponent with a front leg, not a rear, then nuzzle the other ram before walking away as if nothing at all had happened. The bighorn numbers may be declining, Mr. Russell, but they're still using that same high meadow you described in your book, and they're still just as wild and magnificent as when you first saw them. You picked a good viewing spot, I can vouch for that.